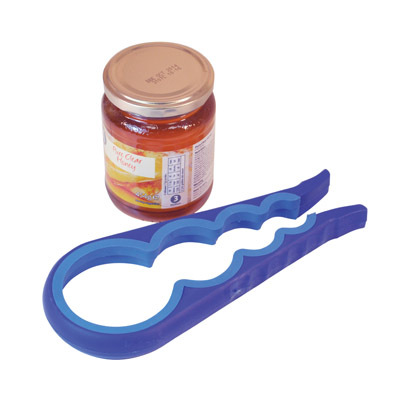 Product code: VM992AC Categories: Home Living, Kitchen Aids. This easy-to-use kitchen aid has been cleverly designed to enable you to quickly open stubborn lids on a huge variety of jars and bottles with just one compact product. It is ideal for users with a weakened grip or limited dexterity. 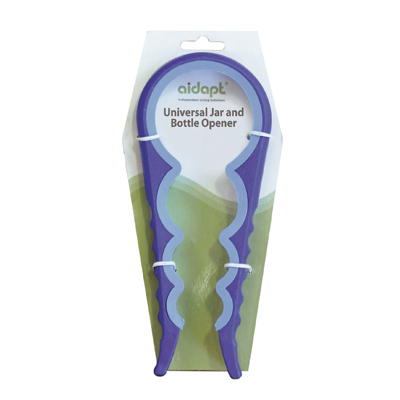 The flexible Universal Jar and Bottle Opener features a shaped rubber trim along the inside edges for a strong grip on the lid, and a comfortable grooved outer edge for you to hold, squeeze and twist more easily. With four differently sized circular sections to cope with the smallest to the largest lids! This compact and lightweight kitchen aid is ideal for users with a weakened grip or limited dexterity, as well as those who want to avoid damaging their nails when opening tins and cans. The Ring Pull Opener simply hooks under the edge of the ring pull and, with a simple pulling motion on the comfortable handle, allows you to easily peel back the ring pull and lid together. The Food Preparation Board is a kitchen aid for those with limited hand use. The Food Preparation Board is held in place by its curved lip resting against the work surface and with integrated non-slip feet. The rear upstand holds bread steady while cutting or buttering. Easily washable.